Attorney Mazariegos is licensed to practice law in the State of Illinois. She received her law degree from DePaul University College of Law with a Certificate in Business and International law in 2012. She obtained her BA in Political Science from Loyola University with a minor in Latin American Studies. During Law School, she dedicated herself to the study of Immigration Law and Human Rights Protection. She completed a 3 month internship at El Centro de Derechos Humanos Fray Bartolome de Las Casas in Chiapas, Mexico a non-profit organization that works in the defense and promotion of human rights. In law school, she was board member of the Women Bar Association and the Society of Asylum and Immigration Law. She also completed a semester at DePaul College of Law Immigration and Asylum Clinic where she focused on U- Visa. In her last year of law school, she was employed as an Interfaith Student Scholar and led a group of law students to New Orleans, LA to help build houses destroyed by Katrina. Attorney Mazariegos has dedicated her life to public service. Since attending Loyola Academy High School in Wilmette, Illinois, Attorney Mazariegos has volunteered at Centro Romero's Legal Department, a non-profit organization. For the past 14 years, she has worked on various complex immigration cases such as NACARA, TPS, U Visa and Appeals. She is proud of her commitment to continue to volunteer weekly at Centro Romero. After graduation, she immediately started her own firm to make sure that competent representation was accessible to everyone. 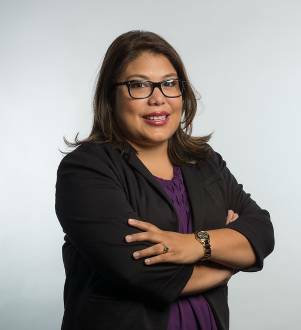 As a first-generation Guatemalan American, she has first hand knowledge of the vulnerability of the immigrant community and the need for affordable and knowledgeable attorney representation. She speaks German and is fluent Spanish.